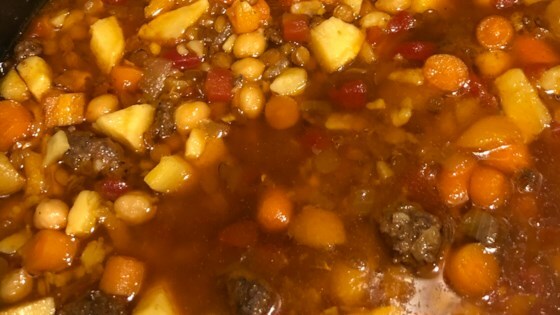 "Inspired by the wonderful spices and flavors used in Moroccan cuisine, this wonderful stew is a hearty one-dish meal. We like to double the recipe and freeze one portion for later. You can also save time, by combining all of these Moroccan spices in bulk and having the mixture on hand to use in this stew recipe, as well as others, like lamb burgers, grilled salmon, and meat rubs. We typically serve the stew with warm bread and a salad." Combine cinnamon, cumin, ginger, cloves, nutmeg, turmeric, curry powder, and salt in a large bowl. Mix in the ground lamb. For most flavorful results, allow mixture to rest, refrigerated, overnight. Melt butter in a large pot over medium heat. Cook the onion in the butter until soft and just beginning to brown, 5 to 10 minutes. Mix the spiced lamb mixture to the onions. Cook and stir until meat is browned, about 5 minutes. Pour the beef broth, chicken broth, and consomme into the pot. Stir in the tomatoes, honey, carrots, sweet potatoes, garbanzo beans, dried apricots and lentils. Bring to boil; reduce heat to low. If making ahead or freezing, prepare stew through Step 3. Simmer for 5 minutes over low heat; remove from heat and cool in the pot or in freezer-safe container. Transfer to the fridge (store for up to 3 days) or freezer. The vegetables store better if not fully-cooked prior to refrigeration or freezing. When ready to eat, (if frozen) thaw in refrigerator for 24 to 48 hours, then pour stew into a pot, bring just to a boil, and simmer until heated through. pretty good, but way too sweet for me and too oily. i added more broth, more salt and next time i will use a lean ground turkey. also, one sweet potato was definitely plenty. I added a big parsnip, I only had one sweet potato so I added two small russet potatoes, and I thickened the liquid by adding flour to the ground lamb and onions, just before adding the liquids. Loved it! Just what I was looking for this snowy weekend. Last time I made it I forgot I had run out of lentils. Too late to get some, so I subbed 1/2 quinoa/ 1/2 pearl barley. I have added dates and raisins from time to time as well as pork or lamb. Added fresh spinach to this recipe and it was great!